We made a 3 hour drive to the Jedi-Robe Store and we were so glad that we did. Firstly and so importantly, Wayne is quite possibly the most personable chap that anyone could wish to meet. He's so clearly passionate and excited about his products and that's hard to find in retail these days. We were after a number of products, a full Storm trooper kit - Jedi robes - a second New Hope Helmet. 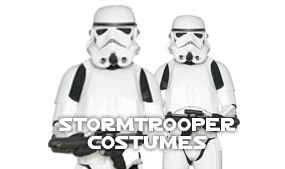 I challenge anyone to 'best' the storm trooper full kit for quality and price that Jedi-Robe has on offer. The attention to detail in this kit is excellent, I spent an hour when I got home looking at Star Wars Movie stills matching parts with those I have lying on my office floor, these parts aren't 'copies' these parts are 'replica'. Wayne decribes the New Hope Helmet on his website as 'Movie Accurate', I would describe them as 'close as you are going to get other than stealing one from the set'. They have weight they are painted properly and they are decalled properly. You feel like you are wearing a proper Trooper helmet. Period. Non better. I'll qualify that with the weight, the detail, searching through as many in movie E11 Blaster pics and they all match the one that goes with this kit. it's heavy, It's cold, and the Jedi's better duck when I point it at them! We are already planning our second trip to the shop . . . for the Jedi purchase . . .
Just brilliant. You would be pushed to find a more friendly and helpful service. After sales is built into the purchase. Wayne will go through so many details with you about your purchase, about future purchases, about telephone support and add on items, replacement items should you need them . . . he's in it for the long game. Thank you Wayne and your backroom staff. A really positive day and see you again very soon. Paul - Laura - Star. Want to blast some Rebels like Paul?